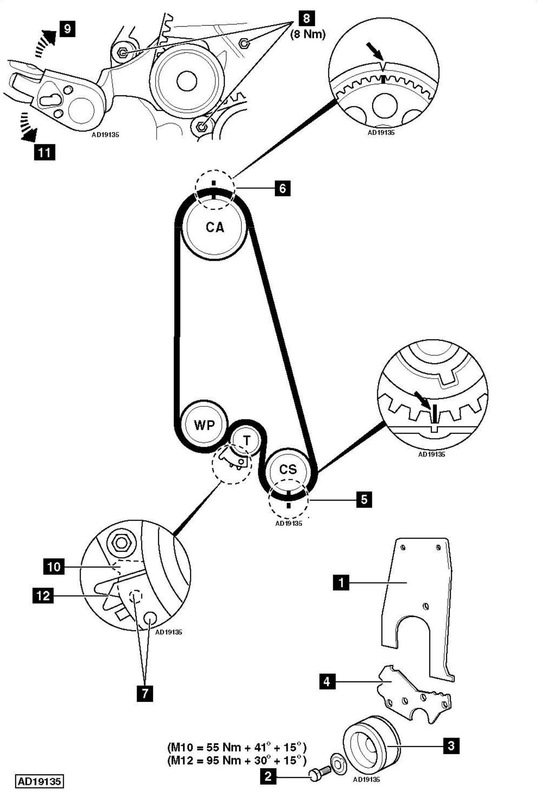 Opel Corsa-B 1.2 1995 cambelt change instructions and replacement inteval. Full guide! Water pump wrench – Kent Moore No.KM-421-A. Air filter, air duct and air intake hose. C14SE: Disconnect intake air temperature (IAT) sensor multi-plug. Fit crankshaft pulley bolt. Turn crankshaft to TDC on No.1 cylinder. Turn movable part of tensioner until holes aligned  . Insert suitable pin to hold tensioner. Remove locking pin from tensioner  . Slacken water pump bolts  . Turn water pump clockwise to tension belt  . Use tool No.KM-421-A. Movable part of tensioner must be against stop  . NOTE: Position of water pump must not alter when turning crankshaft. Turn water pump anti-clockwise  until tensioner pointer aligned with notch in support plate  . Use tool No.KM-421-A. Tighten water pump bolts to 8 Nm  . If tensioner pointer not aligned: Repeat tensioning procedure. M10: 55 Nm + 41° + 15°. M12: 95 Nm + 30° + 15°.